Post-operative patients are at risk for pulmonary embolism because of the time spent in bed after surgery. 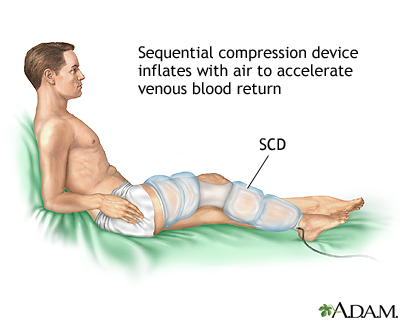 One method for reducing the risk of venous thrombosis is the use of sequential compression devices (SCDs). These are stockings that wrap around the legs and periodically inflate and deflate with air. In part, this prevents the formation of thrombosis in the leg veins by increasing blood flow through the veins. The use of SCDs and early ambulation after surgery greatly reduces the risk of venous thrombosis and pulmonary embolism. Walking immediately after surgery also reduces the risk of thrombosis and pulmonary embolism. SCDs are used after many major surgeries until patients are able to walk regularly on their own.